Ten months old! We’re on the home stretch of the first year and our baby girl is changing rapidly week by week. Shortly after Christmas she started crawling. None of this commando crawling to start off with for her. One day she was rolling to get around, and the next she was crawling properly. Or at least that’s how it seemed. She’s full of fun these days, constantly babbling and shouting DAdadadada and Ah-lal-lal-lal. Despite my best efforts, she has made no attempt to say Mama that I’ve heard. All in good time though. For now she prefers to blow raspberries at me. And she collapses in a fit of giggles if you blow raspberries back at her. I was looking at the Wonder Weeks app yesterday and apparently we are in the middle of a stormy period or a developmental leap, which explains a lot. I don’t think I’ve had more than 3 hours of sleep in a row in a couple of weeks. Thankfully she’s not awake for long, and a quick feed settles her back to sleep in minutes usually. But it’s tiring being woken so often and then heading out to work the next morning. I keep looking at her big brother who would sleep through anything now, and reminding myself that she will eventually sleep for longer again – when she’s ready. Maybe she’ll be just like her brother and stay unsettled between ten months old and when she learns to walk. God knows she is trying her best. In the past few days she is no longer content with crawling. Now she is straightening up on her knees and shuffling along the furniture like that. She hasn’t tried pulling herself to standing yet. I don’t think the strength in her legs is quite there. But I suspect it won’t be long. What a gorgeous little girl! 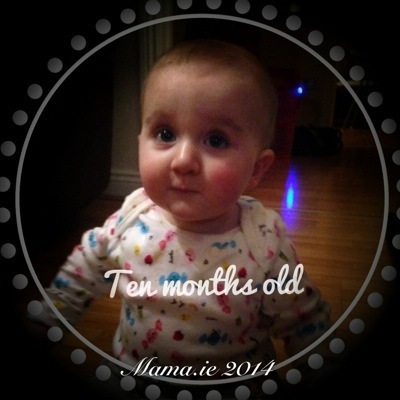 I think when the going gets tough, the only way to get through it is to keep affirming to yourself that this is only a phase and will soon pass… I cannot believe she is 10 months old already!!!! !